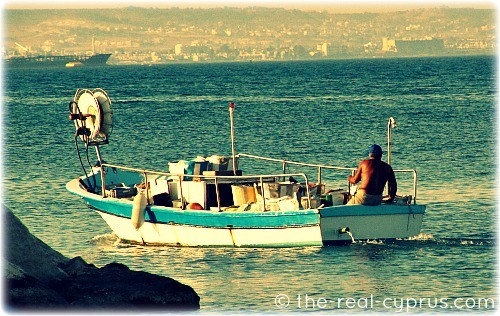 Larnaca Fishing Shelter is a wonderful place to visit first thing in the morning when the boats are chugging away out into the sea to find their catch for the day. Around mid-morning, they return, and sell their stock at the quayside. There is a purpose built covered area with weighing scales, and a table plus a couple of good fishmongers if you need some work doing and you can buy fresh fish straight out of the Mediterranean...how is that for organic food! You need to get there as soon as possible because most of it goes to the local restaurants nearby. Larnaca Fishing Shelter is not really in the tourist brochures or mentioned much in Cyprus Tourist Guide books but I highly recommend if you are in the town to mosey along and have a look, take a walk round it either first thing in the morning as we said for fresh fish or as the sun sets for the day and casts a warm golden glow over the town. Both times are wonderful in the summer to get beautiful light for lovely photographs. It is not hard to find, if you are at the Mackenzie end of town, head towards Kastello Beach and the harbour is right next to it. If you are coming from the fort end of town, it is a bit of a walk but head towards Mackenzie area and you cannot miss it. Currently you will have to avoid the roadworks taking place but you should still be able to find it easily. Take a stroll around and look at the boats, some for fishing, some for pleasure and some I am not sure about at all...they look as though they have been left and forgotten about like some old car in a backyard somewhere. 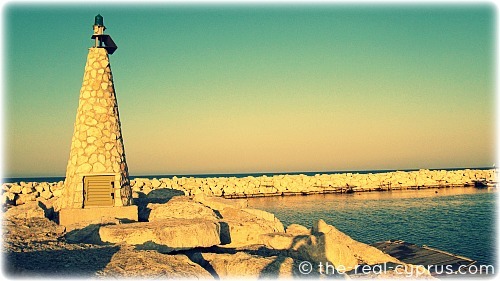 Take a look at the people, some who never really leave the area, their life is totally between the boat and the sea. Talented, simple people who bring charm and life to the area, and a ready smile. 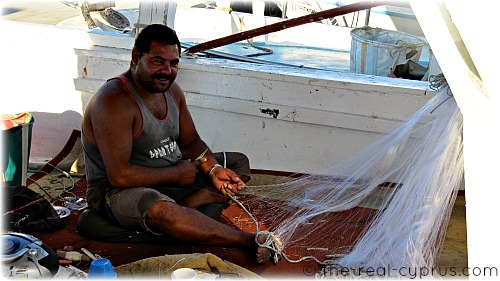 They go out day after day, working hard to bring us back what we love from the ocean. 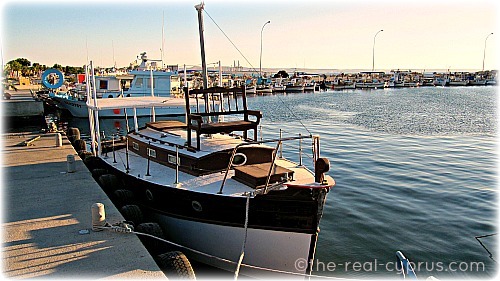 Larnaca is very highly respected around the island for the local fish restaurants, especially the ones that are right on the harbour side. There is a commercial fish restaurant chain, now on the island but why bother with frozen fish when you can have it right out of the water next to where you are sitting? 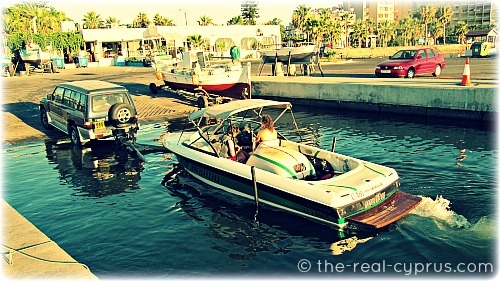 There are always boats moving in and out of the Larnaca Fishing Shelter, some are going fishing and some are just going out for fun, family aboard, dog on the bow and fishing rods hanging off the back end...looking for that elusive one that got away! I remember taking the picture of this little girl, she was having great fun with her dad as they glided slowly back into this small harbour. I was wondering if she would grow up to have a love of the sea and fishing and perhaps one day take over her dads boat? 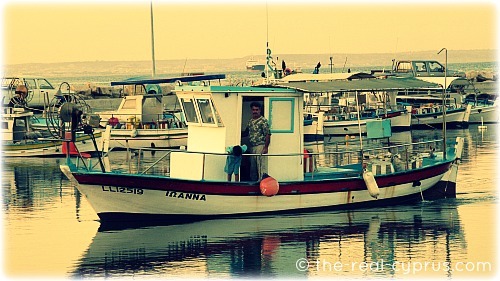 It is not just fishing boats who use the Larnaca Fishing Shelter, plenty of people find their quiet spot on the rocks and sit patiently for hours until they have their tug on the line. 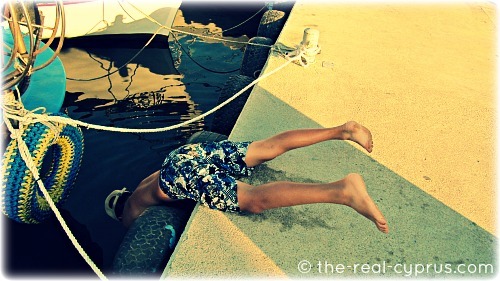 You will see boys with harpoons and snorkelling kit, silently following their prey, only now and then breaking the water when they come up for air and off they go again, stalking that elusive octopus who doesn't want to be caught. Pleasure boats dot in and out of the entrance, slowing down in case they meet the boy with the harpoon! 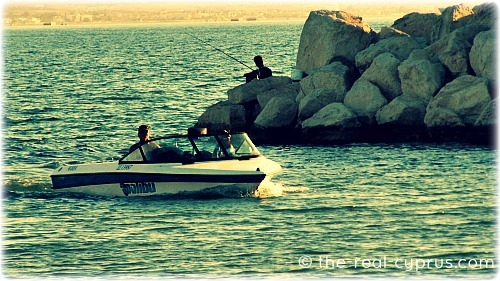 Water ski's in the back, they have been out and about ripping up and down the coastline looking cool. Towards the end of the day, the boats sit gently bobbing in their berth, until the morning sunrise when they are off again to start the cycle all over again. Larnaca Fishing Shelter is sleeping. The beacon lights everyone safely home at the end of each day, when the sky goes pink and gold as the sun sets over the fishing shelter. You get really lovely colours so you might want to go with your camera or video and capture a slice of life that is about as real as you will get anywhere on the island. 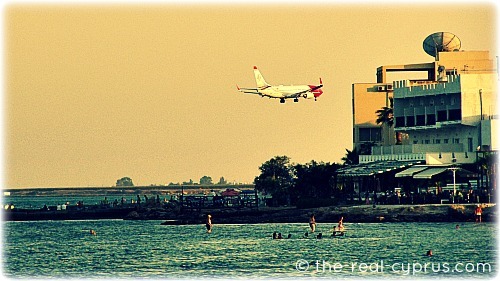 It is a great spot to sit here and watch people, boats and the constant arrival of aircraft into Larnaca Airport. They make a turn around here and then head straight over Mackenzie Beach and land directly on the runway by the sea. 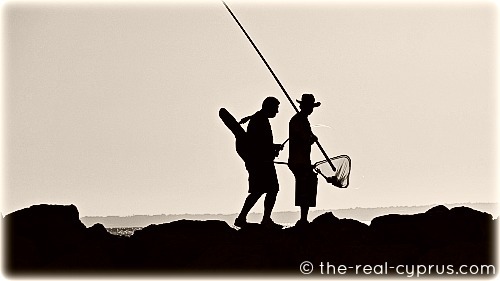 The fishermen are heading home at the end of the day, they have a satisfied smile on their face. The boats are being put to bed for the night if they are not permanently berthed at the Larnaca Fishing Harbour. The boys are heading out one more time before they need to get back to their homework. And this fellow was giving it one more go to catch the Octopus, by this time his friends had all gone home but he was not going to give up or give in. We watched a group of them for ages as they all got fed up. He was going to take his mum home his catch by hand if it killed him. 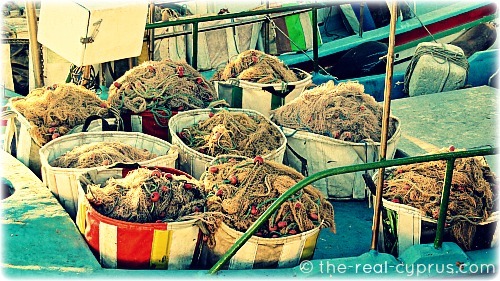 The nets have been put away for the night, it always fascinates me how they keep them so neat and tidy all the time.